The Advanced Combat Optical Gunsights or better known as the ACOGs are the most significant scopes for AR15 models. Designed specifically for the assault rifle platforms, these were initially made for the military and police’ assault rifles and still widely used today even though the ARs have undergone a lot of innovations in their designs and constructions. Today, the best AR15 ACOG scopes are now extensively used by civilians for their hunting, self-defense and competitions. The ACOG is not actually a single scope but a combination of optics put up together to fulfill missions that they were designed for. They are also made to fit to any of the AR models. However, a lot of the ACOG scope varieties have come out lately and although they generally are efficient, there are always a handful of them that can really turn your AR into an efficient shooting machine. To help you choose the best, we have searched for the best AR15 ACOG that may fit into you assault rifle and we have found three. These are the best reviewed so far, very precise and with the most excellent features. The Trijicon ACOG riflescope, we can say is one of the best AR15 ACOG Scopes that is excellent for day and night use. Using its Trijicon Tritium-Phosphor lamp, it does not need a battery for illumination. During the day, this scope stores ambient light on its fiber optics that automatically adjusts to the brightness and contrast requirement of the reticle. At night it utilizes its tritium phosphor that glows thus providing also illumination to your sight. Its reticle which is calibrated for 5.56 flattop rifles can still be accurate at 800 meters but its Chevron Reticle is designed to be zeroed at 100 meters tip. To mount it on your AR model, this scope is adapted with a Picatinny flat top rail adapter and has a neprone scopecoat to protect it from fogs, rain, scratches or any beatings from the environment while mounted. 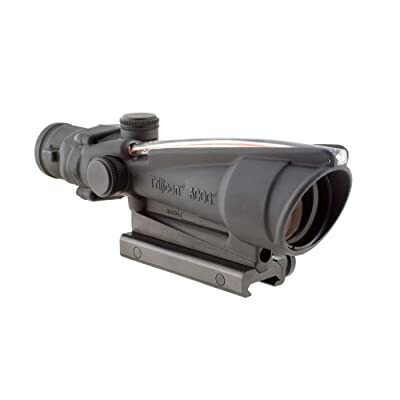 To be more precise, this ACOG scope uses the traditional and accurate distance marksmanship with close-in aiming speed. Featured with BAC (Bindon Aiming Concept) to easily tract and engage targets by using an illuminated aiming point without getting distracted by the unmagnified view of the target. With BDC (Bullet Drop Compensation) feature to eliminate manual adjustments in consideration of the effect of gravity while the bullet is traversing. Large eye volume. This allows you to easily acquire and zero-in on targets even your eye is not properly positioned behind the scope. Does not require battery to illuminate reticle. Magnification: 4X with a 32 mm objective. Waterproof to 500 feet (150 meters). Filled with dry nitrogen to eliminate fogging. Housing is made with military grade aluminum housing. Featured with BAC for day and night use. With Picatinny flat top rail for adaptable mounting. Guarantee for lamp is 15 years. Fitted with neoprene Scopecoat for lens protection. With broad band anti-reflective coated lenses for excellent clarity and light collecting capabilities without distortion. Warranty: Comes with a warranty card. Or call customer service for warranty details. No complaints about its performance so far. However, this scope is widely imitated and sold even on legitimate online stores. Genuine products have serial numbers found on top of the scope. The Trijicon logo must also be embedded on the main housing of the scope. 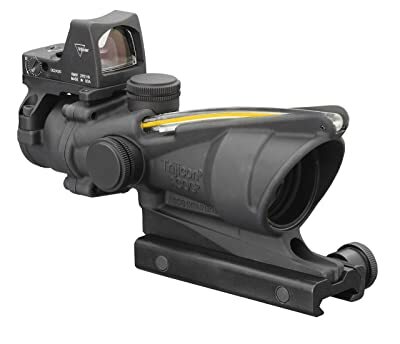 The Trijicon ACOG is a compact riflescope with a fixed power and very versatile with its adjustable illuminated reticle pattern that you can adjust when you’re on a very bright, low light or no light environment condition. Designed to be durable, efficient and precise, it has the combination features of the traditional scopes with a more precise distance marksmanship. It is also featured with variants of bullet drop compensated (BDC) reticle. This scope has a main purpose and that is to provide a more efficient hit potential in various lighting conditions. With superior quality glass lenses, it would never fog even you hunt during winter or on hot and humid environment. With illuminated reticle pattern to adapt to any type of lighting condition even during at night. With layers of quality glass lenses that makes it watertight and waterproof up to 100 meters (328 feet). Proven to be reliable and efficient even on combat field. With bullet drop compensating and ranging reticles. With dual illuminated reticle. Light comes from fiber optics and tritium lamp for use on any light condition. Ranging reticle allows for BDC up to 600 meters and no need for manual adjustments. The Acog 3.5×35 scope is one of the most in demand scopes today and among the best AR15 ACOG Scopes for the game hunters and shooting competitors alike. With a reticle calibrated for .308 caliber, it also has a daylight illumination that is provided by fiber optics and Tritium so you can use it in any light condition or even at night time. With a TA51 flattop adapter, this scope with a red crosshair also has a bullet drop compensator and with field view at 100 yards. The eye relief is about 3 inches diameter which is big enough not to strain your aiming eye during hunting. Users generally love this scope and consider it a battle combat range scope and can still be efficient up to 300 yards. With both eyes open, you can easily acquire a quick target acquisition thanks to its high-tech reticle features. Specifically calibrated for .308 caliber (7.62mm) flat-top rifles. Includes flat top adapter for military style rail (TA51). Daytime illumination through fiber optics and Tritium that enables night illumination. Field of View: 100 yards. Warranty: Call customer service for details. One user has difficulty seeing targets with sunset light. These three best AR15 ACOG scopes actually belong to the most favorites by people who own assault rifles for competitions. Though they almost have the same qualities with little differences in their zooming capabilities and field of views, all of them are featured with fiber optics and Tritium that enable their scopes to filter any lighting conditions and to provide greatest illumination. Basically made by one company, Trijicon, this company is refuted to be one of the world’s best manufacturers of ACOG scopes. Therefore, we cannot deny the fact that these products are all reliable and always worth your money. But then, we also like to say that among the three we prefer the Trijicon TA31F 4×32 ACOG with Dual Illuminated Chevron .223 Ballistic Reticle. This is because it does not need batteries to keep it working. So even if you’ll be spending days in the woods hunting, your scope can maintain its capacity and you can keep on shooting with accuracy. This scope which is calibrated for 5.56 flattop rifles can also be dependable at 800 meters view though its clearest sight is at 100 meters. 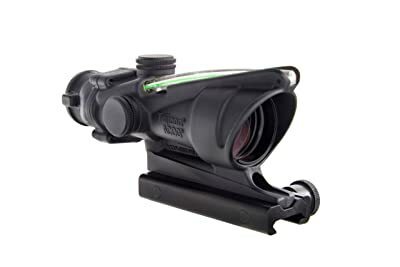 And with a flat top rail adapter plus protection from the environment and being waterproof, you are ensure that this scope will last many years and will remain to be working perfectly.